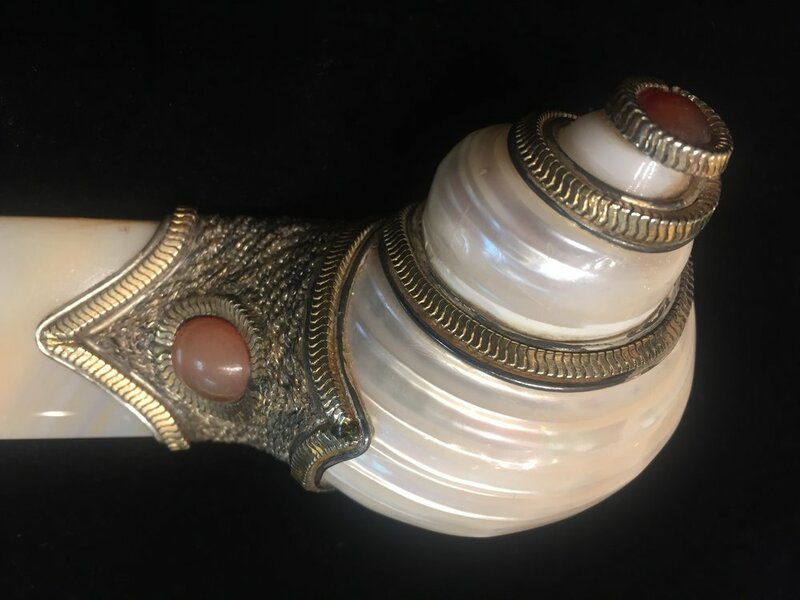 Designed by the world-famous artist and designer, Naef Orfaley, this remarkable letter opener created of parcel-gilt silver mesh, cabochon gemstones, shell and agate. Naef Orfaley (born 1928) is an internationally known Filipino artist. 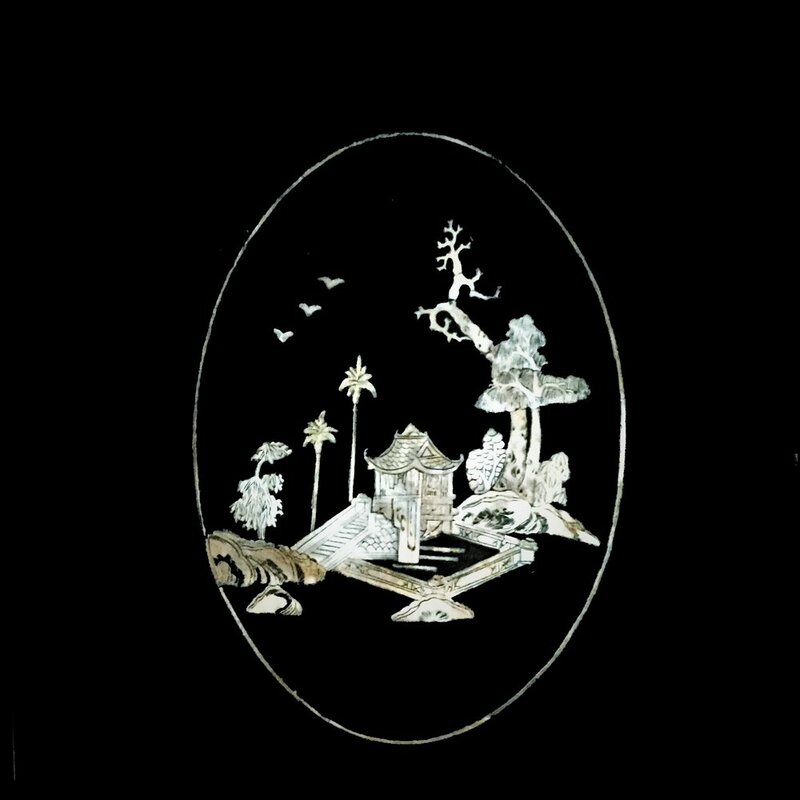 Still active in designing and producing beautiful jewelry and objet de virtue, his creations often times offered by such leading auction houses, as Christie’s and Sotheby’s, including his famous little sculptures made of ostrich eggshells, silver, gold and semi-precious stones. Although Orfaley family moved to Argentina when Naef was very young, and he later moved to New York City, Naef Orfaley still shows his love of his natal country in his inventive and whimsical animal figures inspired by those tropical shells . 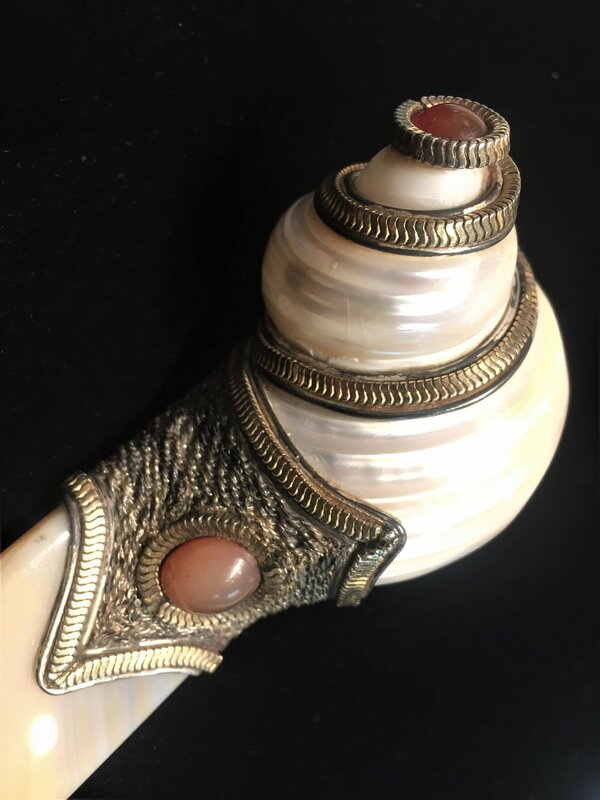 The waters surrounding the Philippine Islands are the source of many of the beautiful shells found in collections and incorporated into decorative items, including ones for personal adornment. 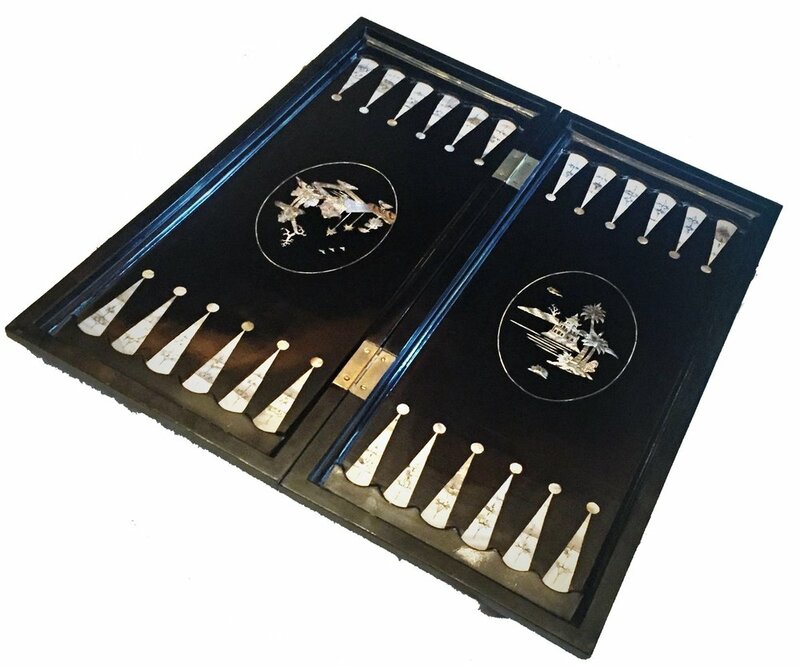 This unique and luxurious backgammon, chess & checkers set is hand-made in the 1960s of lacquered wood, intricately inlayed with mother-of-pearl and abalone shell. The backgammon/checkers and chess pieces are artistically hand-carved out of water buffalo bone and horns. Rare! Dating back to the 1960s, this great game set remains in excellent vintage condition. 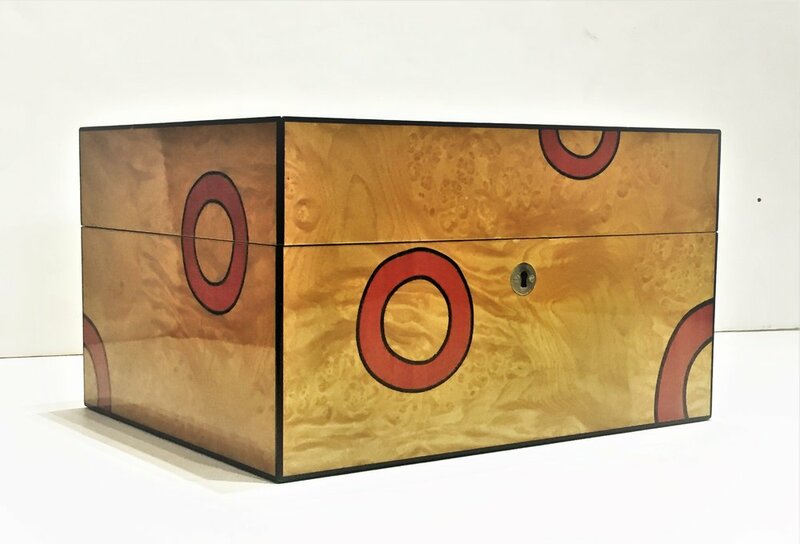 Classy and elegant, constructed of Karelian Birch in a lacquered finish and a uniquely designed Black Walnut inlays stained red, this handsome humidor combines the unique Art Deco inspired design and functionality, making a superb choice for the discerning cigar smoker. The interior, completely lined with genuine Spanish cedar, including two removable trays with adjustable dividers that hold up to 50 cigars. It also features humidifier, hygrometer and solid internal locking hinges. Presented here is a collection, sold as a lot of 8 pairs of vintage 875° silver cufflinks with a variety semi-precious stones, made in different techniques. All cufflinks were made in Soviet Union, in the period from 1940's to 1970's. This is a unique opportunity for a gentleman who not only appreciates a formality in the way he dresses on certain occasions, but also for someone who prefers his accessories with a touch of a nostalgic retro feeling , and of a fine quality yet! These cufflinks will add just the right amount of chic and elegance to your everyday shirt and definitely make a statement of your unique style. Each pair looks prestigious, simple and expensive. - 4 pairs (gilded) from the 1940's-50's --- set with a large, beautifully faceted natural Rock Crystal (Rhinestone), called in Russian "Gorniy Khrustal" (Mountain Crystal); which are a genuine Russian quartz healing crystals, originating from the Polar Ural mountain. Running approximately north to south through western Russia, they are an abundant source of mineral wealth Russian quartz from the Polar Ural mountains is renowned for its piezoelectric charge; often manifesting special qualities, suchas a powerful resonance and an extraordinary quality of light. All stones are transparent and sparkling! - 2 pairs from the 1960's --- in the Niello technique, very popular in Russia for severalcenturies; and which is a black mixture of copper, silver, and lead sulphides, used as an inlay on engraved or etched silver. - 1 pair (gilded) from the 1970's --- with Brown Ural Onyx, an excellent stone for releasing negative emotions, such as sorrow and grief, and therefore brings good fortune and helps in recognizing personal strength. This brown- colored stone helps in relaxation, and in facing various challenges in life, especially if one suffers from a lack of life energy and exhaustion. - 1 pair (gilded) from the 1960's --- with rare butterscotch-color Baltic Amber, a fossilized tree resin. Baltic amber in particular (mined from near the Baltic Sea) additionally contains a substance called succinct acid. Historically, it is believe that when worn on the skin, body heat causes Baltic amber to release an oil containing succinct acid which, if absorbed into the skin, might act like a natural Ibuprofen, blocking pain and reducing inflammation. All cufflinks in the collection are stamped on the base 875° for sterling silver; a manufacturer's mark; and a Soviet Star with hammer and sickle in the middle, indicating that these cufflinks were made in the USSR during the Early Soviet Era - circa 1940's, 1950's, 1960's and 1970's. The cufflinks are in excellent vintage condition. They would make a wonderful present for yourself or will surely delight anyone you love! 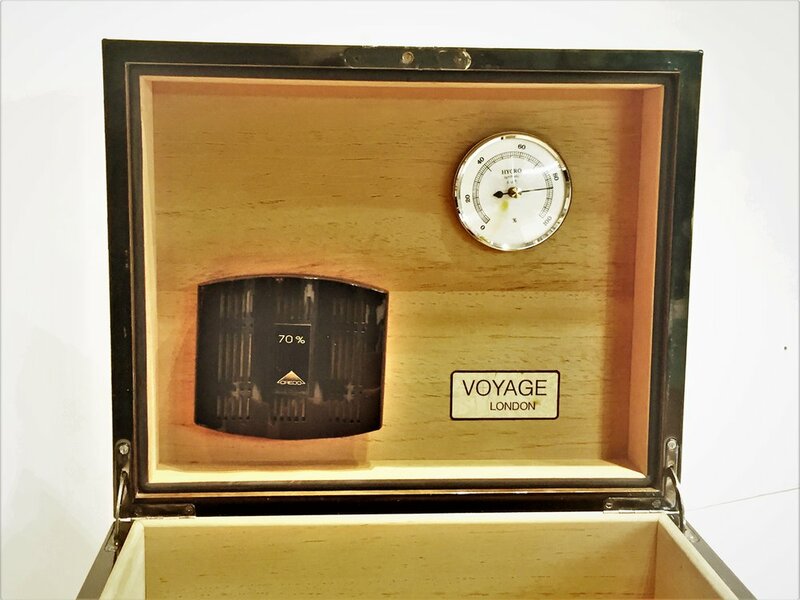 Made of such sophisticated materials as stingray skin, sterling silver and rosewood, this beautiful and rare cigar humidor with hydrometer of an outstanding workmanship features a remarkably simple and elegant design by the famous French silversmith, sculptor and designer, Jean E. Puiforcat. Both, the artist and silver hallmarks are stamped on one of the top silver edges of the humidor. Jean Puifgorcat was a French silversmith, sculptor and designer. Miller's Antiques Encyclopedia calls Puiforcat the "most important French Art Deco silversmith. Puiforcat served in World War I. 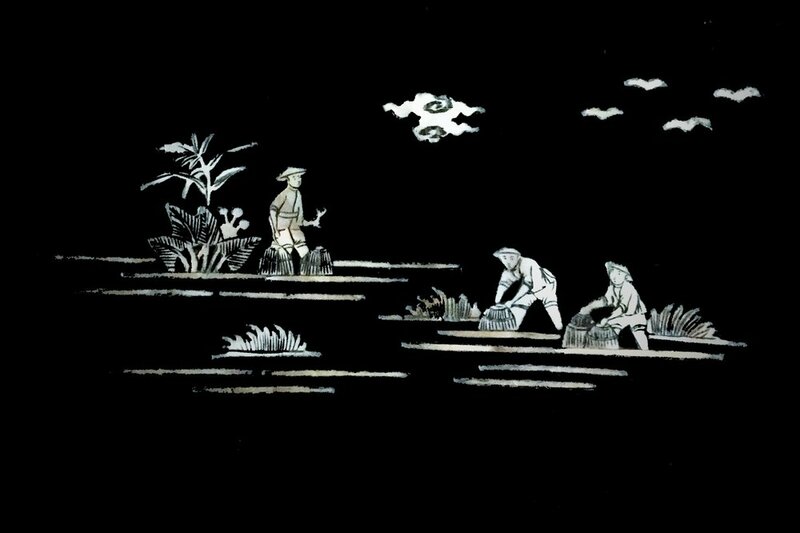 After the war, he apprenticed as a silversmith and a designer. He lived in Paris and designed in the Art Deco style. His silver work had smooth surfaces and was based on the geometric series. Ivory, onyx, lapis lazuli, shagreen, gilding and rosewood were used to decorate pieces. Puiforcat left Paris and moved to Saint-Jean-de-Luz, around 1927, where in 1928 he co-founded the Union des Artistes Modernes. He started designing tableware and by 1934 he also had designed liturgical silver. In 1941, he moved to Mexico. After his move, he began exhibiting in the United States. Andy Warhol collected Puiforcat silverware, which he acquired while visiting Paris in the 1970s. In 1988, Warhol memorabilia was sold at Sotheby's. The collection sold for $451,000 and a tureen with an aventurine decoration sold for $55,000. Works by Puiforcat are held in the collections of the Cooper-Hewitt, National Design Museum and the Victoria & Albert Museum in London.